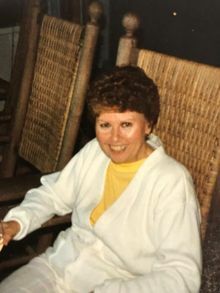 Elsie A. Bergeron (Robinson) 85, of Hooksett, NH passed away peacefully on Monday, March 11, 2019 with her daughter and friends by her side at Villa Crest Retirement Center after a long battle with Alzeheimers. She was born in Chelsea, Mass on September 20, 1933 the only child of the late Ralph Robinson and Annette C. Robinson (Metivier). Elsie graduated from Central High School and worked for many years at AIG (American International Group) before retiring in 1996. She was a devoted and loving wife, mother and Nana. Elsie enjoyed spending time with her family and her two cats, Oreo and Tigger, who she adored immensely. She loved music, which she would listen to everyday, going to Holiday Craft Fairs, Shopping and having her hair done ritually every Saturday. She will best be remembered for her beautiful smile and her loving, generous heart. She leaves behind her daughter, Donna A. Roy of Manchester, granddaughter, Kerri A. Roy of Manchester, former son- in- law, Michael A. Roy of Manchester and several nieces, nephews and extended family and friends. She was predeceased by her husband Roger R. Bergeron, the love of her life, with whom she was married to for 64 years. Calling Hours in remembrance of Elsie's life will be held on Friday, March 15th at 11:00 AM at Phaneuf Funeral Homes, 243 Hanover St. Manchester NH, with a funeral service beginning at 1:00 PM. She will be laid to rest on Saturday, March 16th at 11:00 AM at the Mt. Calvary Cemetery mausoleum, 474 Goffstown Rd. Manchester, NH. Family and friends are welcome to gather at the funeral home on Saturday at 10:15 AM in preparation for the cemetery committal.